Company is operating at full capacity and new greenfield expansion is not coming online for another 2 years. Which means production could remain flat at best. 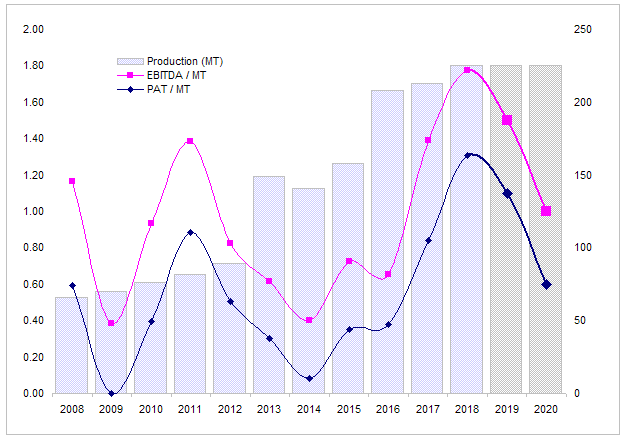 EBITDA/MT and PAT/MT is at a 10 year high and can likely to come down to more reasonable level of Rs 1 Cr/MT and Rs 0.6 Cr/MT which are 10 year averages respectively. Assuming EBITDA/MT and PAT/MT drop to 10 year average in FY 2020, EBITDA works out to be 225 Cr and PAT works out to be 135 CR which is about 60% below current levels. Current market cap is 1000 Cr so company is selling at 7.5 times FY20 PAT of 135 Cr. Looks reasonably priced. However, considering net cash position of 575 Cr as of Sept 2018, this company is actually selling at only about 425 Cr which is only 3 times FY 20 earnings. That’s what makes the valuations attractive but an expected fall in PAT will probably keep the buyers from jumping in. Margins can also take 2 or even 3 years to revert to mean which can stretch the timeline profitability will be impacted. That’s another factor that will keep the buyers away for a while. One silver lining is that since company is operating at full capacity, EBITDA/MT may not fall to 10 year average. During 2009 and 2014 where margins fell to a very low levels company was operating at low capacity utilization and had recently expanded capacity. If that turns out to be the case, stock should provide decent returns. Disc: No position but interested. Could you share your thoughts on corporate governance and how willing promoters are to share profits with minority shareholders. These seem to be important especially in current environment. I realise such a judgement is subjective but any pointers would be useful. Hi @Yogesh_s - Average P/E for last 3 years or 10 years has been in the range of 4-6. Capacity constraint is a recent challenge. Any others reasons that you can think for such a low confidence by market in this business ? I am not sure if lack of utilisation leading to erosion in OPM% warranted such a low P/E. Corporate governance is a tricky subject. No company or promoter is black or white, everyone is some shade of grey. That shade changes from investor to investor and depends on stock price. Generally when price goes down, investors blame it on corporate governance as it is a catch-all excuse for justifying a fall in price. Debt is nil. That’s a positive. In fact company has paid down debt over the years. Executive compensation - That’s high. However some of it is justified by good performance. OTOH, promoters taking money out through front door reduces chances that they will take it out of back door. Taxes are being paid. That’s a positive. Cashflow is strong. That’s a positive. In line with cash profits. Management communication. I have seen last 10 years annual reports and company has provided enough information about the company without hiding key facts. They generally put a positive spin on everything but that’s their job so won’t call it a negative. Walking the talk - My impression is that management is generally good at this parameter. Cash hoarding - They are sitting on huge cash pile generated over last 3-4 years but I won’t call it a hoarding. They had to borrow heavily during 2012-2014 so they are being defensive here. Plus this is a cyclical industry so having a large pile of cash provides a safety net. And they have planned capex and they are looking at NCLT cases for inorganic growth as well. So overall not negative but this is where walking the talk will be the key. Dividend is low. That’s negative. But it has gone up in last 3-4 years in line with earnings. To me dividend growth is more important that level of dividend. They have also delivered growth which is double the industry growth so they clearly have growth opportunities so I would rather have the management not distribute too much dividend but invest it back in the business. Profitability is high. Even at the bottom of the cycle company is profitable while others reported huge losses. At top of the cycle company is reporting 40% ROE which is great. Over a cycle average ROE is 28% which is excellent. Working capital is low and company is getting credit from suppliers. That’s a positive. since smelting is a commodity business, such companies generally sell at book value even if the company is generating a high return on that book value. Market is valuing the company as a multiple of book value and not as a multiple of earning. Another factor is that downcycle in this industry can last 2-3 years so investors prefer to stay away until there are signs of a turnaround. That can depress price. 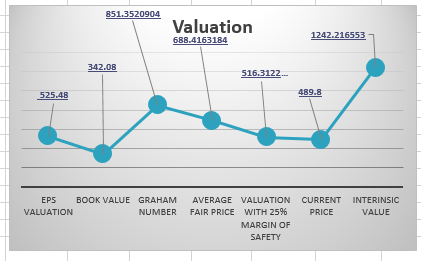 company has been generating high ROE (E/B) which makes the E part of P/E high and results in low P/E since market is valuing the company on P/B basis. This being a small commodity company m it likely that it will trade at a discount to larger companies. As soon as earnings begin to rise, investor begin to anticipate the downcycle so price begins to drop. That’s depresses P/E as well. SEBI has asked clarification from Maithan Alloys regarding this price rise. Lets wait for their reply. The Exchange has sought clarification from Maithan Alloys Ltd on February 28, 2019 with reference to significant movement in price, in order to ensure that investors have latest relevant information about the company and to inform the market so that the interest of the investors is safeguarded. 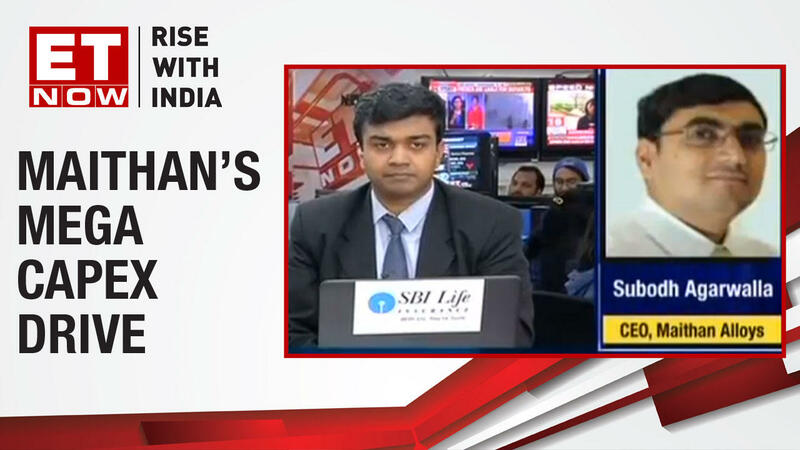 Subodh Agarwalla, CEO of Maithan Alloys talks about their 600 cr investment in expansion plans. Listen in for more details! It is commodity converter and without having good view of the conversion margins and the underlying commodity, it is futile to look at valuation in isolation. 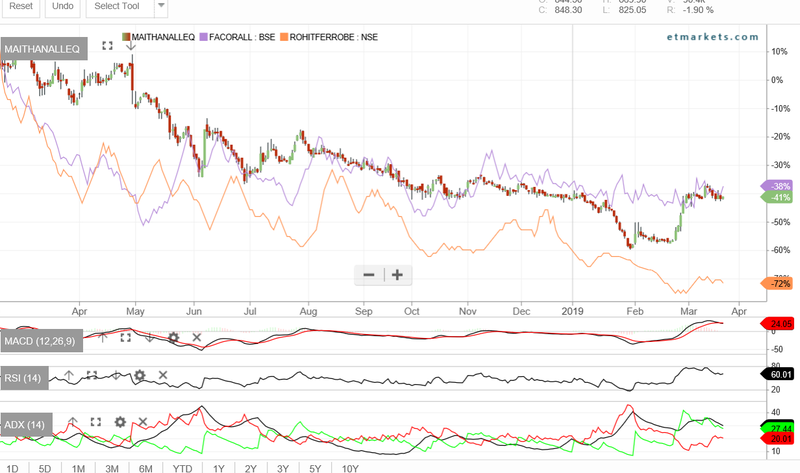 It is a good company in the commodity sector but difficult to value IMO.